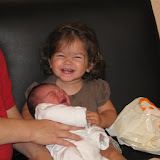 The Eshel Kids: I have a new brother! I have a new brother! I'm sure by now you all heard the news, daddy took time getting to his computer... but now I HAVE A BROTHER!!!!! He is so cute, I love to hug him and kiss him, and mommy and daddy let me - because I'm such a big and good girl - lucky me! Anyway now that I have a new brother do you think he should get his own blog, or share mine? I'd rather hate losing my nice colors (because when you share you have to be equal), but I was here first anyway... What do you say?